Come to Bell Socialization Services 50th Anniversary Fundraising Party for hors d'oeuvres, anniversary cake, door prizes, and more! Help us celebrate the first 50 successful years of Bell and welcome the next 50! 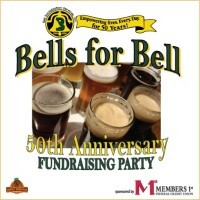 All profits from the purchase of every draft of a Bells Brewery beer will benefit Bell Socialization Services. Special thanks to Members 1st Federal Credit Union for being the exclusive sponsor of the event. Fifty years ago to the day, "The Bell Club" held the very first meeting of what would be known as the Monday Night Program, a social gathering for people who had been discharged from local psychiatric hospitals. That night's travelogue was the start of something no one there could've ever imagined would evolve into what Bell Socialization Services, Inc. is today.